There are a number of definitions of HMOs used by various authorities. HMOs include any dwelling which houses 2 or more family units. A licensable HMO is essentially any premises which houses 5 or more family units, and/or a building over 3 floors. A family unit is defined as any one or more person who lives as a separate unit in a premises. 2 single unrelated persons living in the same house yet separately constitutes a HMO. Any premise which has been converted to self contained flats prior to the 1991 building regulations is also an HMO. Some purpose built blocks of flats are not included as HMO's. Clearly there will be varying risks. 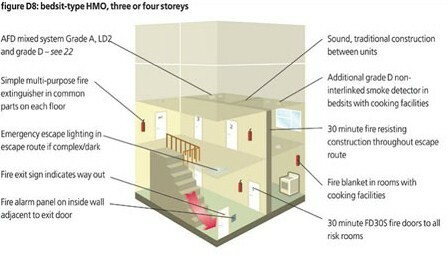 There are two principle enforcing agents who are concerned with fire safety issues, the local council who can use the relevant fire safety section of the Housing act 2004 and the local fire authority who will use the Regulatory Reform (fire safety) Order 2005 (RRO) to enforce fire safety issues in HMO’s. Joint enforcement actions are quite common and the two authorities usually work closely together. If any gas safety issues are involved, the Health and Safety Executive (HSE) will also be involved and will use the Gas Safety (Installation and Use) Regulations 1998 for thier prosecution/s. All HMOs will come under the control of the Housing Act 2004. Most licensable HMOs also come under control of the RRO 2005, although it will only be the common areas that can be enforced upon. Section 254 of the Housing Act 2004 lists the full definitions of HMO’s. Phoenix Fire Consultancy – Keeping landlords legal and tenants safe. Phoenix Fire Consultancy provides fire risk assessments and fire alarm testing packages for all sizes of HMO. Landlords or managing agents can do it themselves, if they have time, or we can provide a full report and action plan very cost effectively. Several HMO landlords have been imprisoned under the RRO 2005 and other legislation, and a letting company was recently fined £32,000 for offences relating to a 7 bed roomed shared house under the Housing Act 2004. (see the NEWS section for more info) Fire safety in HMOs is taken very seriously by the Fire Authority’s and the local council housing authority's. Most fire deaths occur in the home, including HMO’s. • Routine testing – at least one detector or call point in each zone should be tested weekly to ensure correct operation of the system. Any defect should be recorded in the log book and action taken to correct it. • Routine maintenance – a six-monthly service should be carried out by a competent person, usually a specialist alarm engineer, under a maintenance contract. It entails a full test to ensure compliance as specified in with BS 5839: part 1, section 6. It should be recorded in the log book and a periodic inspection and test certificate issued. • Routine testing – these systems should be tested every month by use of the test button on the smoke alarm. • It is recommended that all detectors should be tested at least once a year to ensure that they respond to smoke. Tests should not involve the use of open flame or any form of smoke or non-specific aerosol that could contaminate the detection chamber or the electronics of the detector. Suitable specific test aerosols are available. The test is usually carried out by a specialist alarm engineer under a maintenance contract and should be recorded in the log book, with a periodic inspection and test certificate issued.